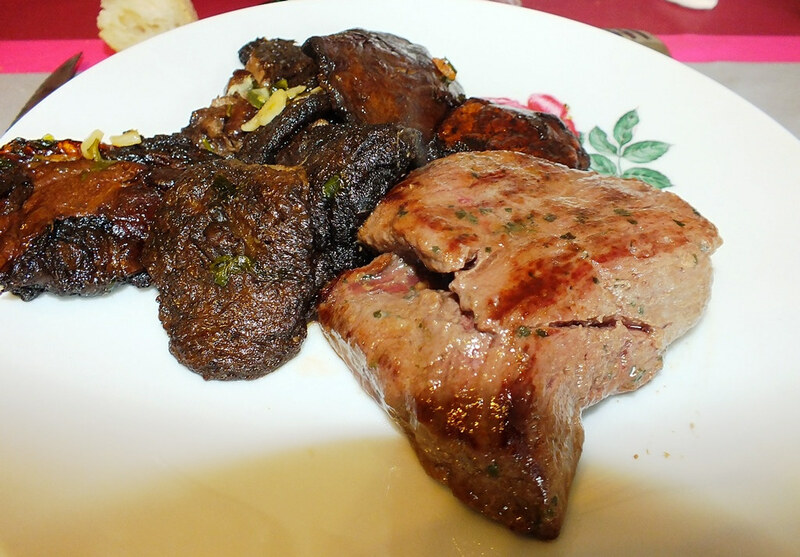 Home » Food » Ostrich Steak and Ceps? Boletus? Penny Buns? Porcini? About a year ago, I was ready to return to France for Christmas and New Year’s. As it was Winter, and it rained for pretty much the entire two weeks I was there, I didn’t do much (I mean, apart from being home and with my family) but eat. After all, food is one of the best things France has to offer, especially in winter on rainy days. I have posted a few pictures of more or less traditional French dishes here, but today, it’s not exactly a traditional dish. 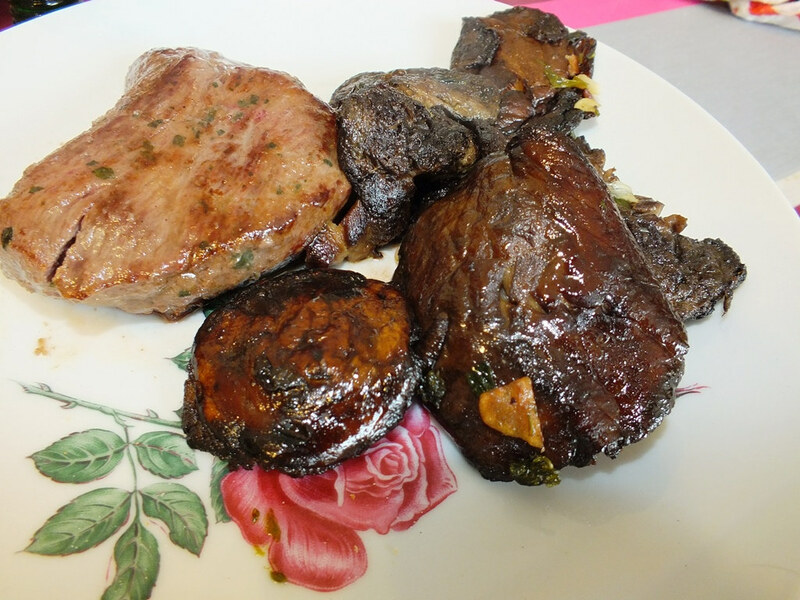 What it is though, is an example of how varied the food can be in France, and always delicious of course. When I lived in North America, one thing that baffled me was the fact that Americans know just a handful of meats (beef, pork, chicken and turkey, am I missing any? ), and it’s not much better in Japan as Japanese people started eating meat under American influence. 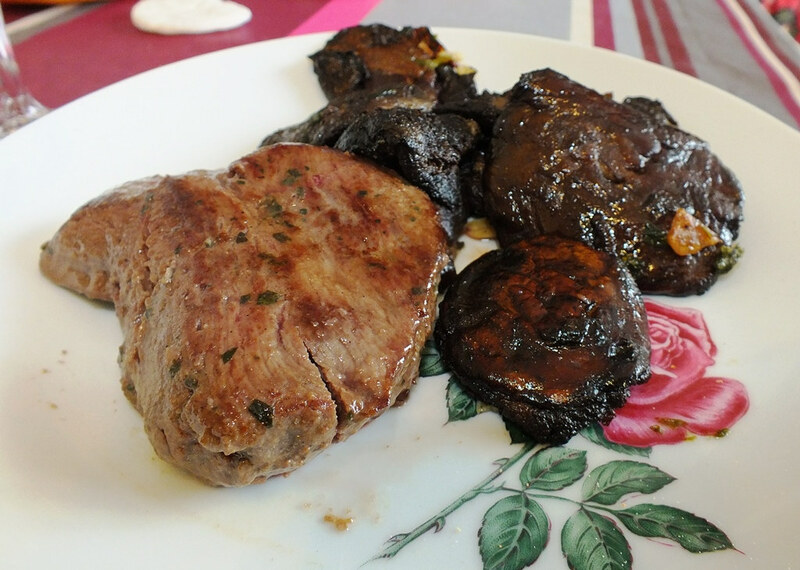 Yes, this is an ostrich steak, and honestly, while it’s not a meat that one eats on a regular basis, and it can be pretty hard to find at times, I think ostrich is one of my favorite meats (probably only topped by duck), and no, it doesn’t taste like chicken. By the way, I’ve always found this expression completely silly (and very representative of the lack of culinary education, which leads to underdeveloped taste-buds in North America). Nothing tastes like chicken! Not even chicken, as different types of chickens will taste different from each other, and even different parts of the same animal will have different tastes. So ostrich tastes like ostrich, and it tastes delicious. 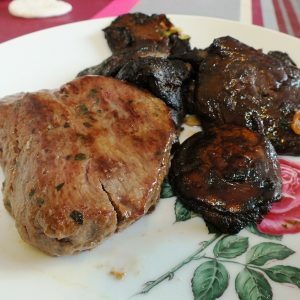 You may be wondering what is the thing with the ostrich steak, and it’s a mushroom that’s possibly the most delicious mushroom in the world, and while it exists in many places in the world, it seems to be the most common in South West France. Now, I have a problem with it. I have no idea of its name in English. In France, we commonly call it “cèpe“, sometimes “bolet.” Its scientific Latin name is Boletus Edulis. Looking up online, I’ve found “cep“, “penny bun” and “porcini” (the latter sounds more Italian than English), but I’m familiar with none of them. I assume that cep is just a translation from French and penny bun sounds British (and I’m not always familiar with the intricacies of British English). It probably doesn’t have a common name in the US, as it is not eaten to my knowledge (fools!). Anyways, ceps are the best mushrooms on Earth (with truffles, but contrarily to truffles, they’re affordable, and/or easy to find and pick up in the woods), and have some if you never did and have the opportunity. Hi David. Just discovered your site and enjoying it thoroughly. Just wanted to tell you that Americans also eat duck, geese, pheasant, which is quite common in the US. Alot of other meats are not familiar simply because they are not breed in abundance here or simply not native to our country. Glad to know that some areas aren’t a culinary wasteland. In seven years in the country, I had duck once, in a French restaurant. And I’ve never found any of those meats (never found any meat that’s not beef, chicken, pork or turkey) in a store. I am not sure where you lived in the USA, but I was surprised to see this post as America has had such a long tradition of eating strange meats in different regions that sometimes freaks out foreigners. For example, in the south east they have a tradition of eating anything from a chicken or pig, yes, but also squirrels (my father grew up on these), deer which they call ‘Venison’, possum, alligator, crawdads (crawfish), frog legs (in the Deep South and upper Midwest), bear (although not so popular anymore), mahi-mahi, quail, and in some areas even snake! Some places in the upper Midwest still eat a lot of buffalo. The Northeast is famous for its lobster and the Northwest for its salmon. When I lived in Alaska moose was very popular (I absolutely hated the taste) and if someone hit and killed a moose with their car, they would collect it and give it out to people to eat! Whale meat is still eaten there pretty regularly. And let me just tell you, you will never have better crab than fresh Alaskan king crab. It is legendary in the culinary world. I still dream about it. There have been several ostrich farms in the USA for many years where you can go online and order Ostrich meat. But no, you probably will never find it in a grocery store here! Channy, thanks for your feedback, but most of the meats you’re mentioning here (I’m excluding the fish and seafood, it’s a different thing) is meat that will be eaten either very locally, or meat that is the product of hunting. I’m talking about everyday life meat that can be found at any store anywhere in the country here. Yes, I have eaten unusual meats in the US too; alligator, venison (which by the way comes from the French word “venaison” which means “meat from large game”), buffalo (can’t remember if I’ve eaten it in France or in the US though), but in a grocery store, I have always only seen four meats: beef, chicken, pork and turkey, and 99% of Americans I know only know those. Haha Yes. you are probably right! It used to be different here. My Father never had Cow steak until he was in his 40’s. It was all Squirrel or pig or chicken, Alligator or bear. If I saw bear meat in a store I would probably be shocked. I just love your Food and japan posts. Please don’t stop Mister David. You’re a gem. Thinking about it, I should post more about Japanese food here as it’s a bit off-topic there. So, stay tuned. Hello David. Lovely pictures of delicious-looking food! Not exactly unheard of in my part of the U.S., though. We have both ostrich and porcini here, and it’s not a very populous region either. I love good food too and prepare pretty much everything myself from the best ingredients. (See, there are some Americans who don’t eat peanut butter or Spam!) Wish I lived in France just for the food. 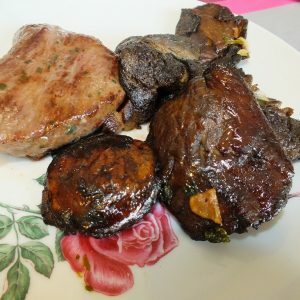 Actually, I wish we ate like the French in the U.S. By the way, I’ve found quite a variety of meats in addition to the usual ones–deer, elk, ostrich, duck, bison, veal, lamb…. They aren’t that hard to come by where I live.